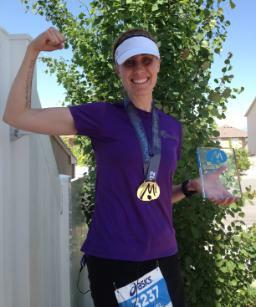 Rachel won her age group at the American Fork Canyon Half Marathon! The task in front of you is NEVER greater than the strength within you. 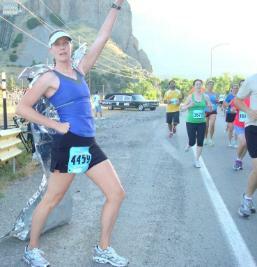 Feeling good and knowing I had a PR IN THE BAG at mile 20 of Ogden. 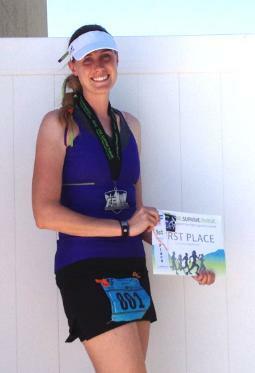 I love to inspire others around me and to share my love of running with everyone. Plus, I LOVE to have fun at a race and get the crowd involved and see people achieve their goals!!! When my daughter got her cast removed the Doc noticed my race bibs and well…you know how runners are! After about 30 min we’d realized I was pacing and he was running Riverton half. He said he’d look for me and try to keep up. He ran the WHOLE way with us. Through the crazy wind heading south, the monster S curve coming back…ALL of it. He’d say from time to time he was done and I wouldn’t take it for an answer and would just divert his attention. He made it in about 10 seconds in front of me. BEST stranger running experience EVER! Because we have FUN! Plus, I’ve got SO many inspirational quotes memorized it would be like searching the internet in the middle of a race for one. The task in front of you is NEVER greater than the strength within you! I love running…seriously, love it. I don’t understand why everyone doesn’t do this! If they only knew how wonderful it was!! I want to share that love with the world, and have fun doing it! Honestly, none. I’ve considered a time or two running for Lymphoma society, but I’ve just never done it. Fund raising scares me because I hate asking for money. This may sound horrible, but it is the truth.